Despite being rudely snubbed by the seven appointed members of the Chicago Board of Education at the Board's February 22, 2012, meeting, parents across Chicago who have been organizing in opposition to what many are now calling the "Longest School Day" being forced on all CPS schools by Mayor Rahm Emanuel continue to organize and protest. Informal meetings are taking place from the city's farthest north side wards (near O'Hare Airport) all the way to the precincts of Hegewisch (which is closer to the Gary Indiana Airport than it is to O'Hare). The one thing that the parents have in common is a stunning and consistent critique of both the rationale and the proposals coming out of Chicago's public schools administration to implement the mayor's plans. Plan to Attend This Important Meeting Regarding Your Child’s Future School Experience! 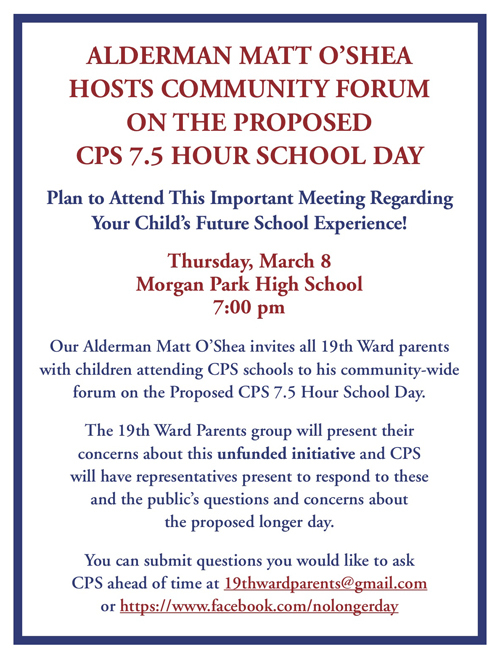 Our Alderman Matt O’Shea invites all 19th Ward parents with children attending CPS schools to his community-wide forum on the Proposed CPS 7.5 Hour School Day. 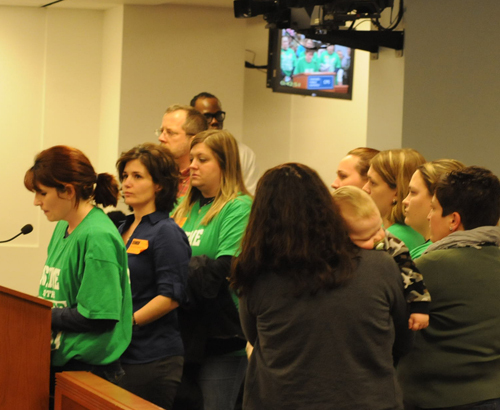 Denise Murphy, whose children attend Mount Greenwood Elementary School on Chicago's far southwest side, spoke out in opposition to the "one size fits all" approach being taken by the Chicago Board of Education to the Longer School Day. Sporting tee shirts that read "Ask Me About the Longer School Day," Murphy and other parents from that community demanded that CPS officials modify the too-long proposal to recognize the developmental needs of children across the ages in CPS schools and the plans and wishes of parents for sports and other after-school activities. Substance photo by George N. Schmidt.The 19th Ward Parents group will present their concerns about this unfunded initiative and CPS will have representatives present to respond to these and the public’s questions and concerns about the proposed longer day. I live in Evanston. Our middle schools run from 8:30 am to 3:35 pm. That includes a full period lunch and a recess time. Our elementary schools have different open/close times due to busing schedules. The school that my daughter attended is from 8:00 am to 2:45 pm. That includes a full lunch period, plus gym 5 days a week. Non-academic classes included art, drama, choral and instrumental music, industrial arts, and home ec. She also had handbell choir (don't know if that's still going on as the teacher passed away a number of years ago). In 7th and 8th grades, the students had the opportunity of choosing three of the non-academic classes each year, which they had for 1/3 of the year. Since she graduated from 8th grade in 1994, I'm not sure what other opportunities she had or if some of the class and arrangements have changed. She figured out one year that she was in school for about 3 more years than Chicago's students because of her longer days. She didn't need to go to Texas to come to that conclusion. 'Nonacademic' -- includes the arts?! As long as CPS and others, including parents, students, administrators and even some teachers, consider the Arts as 'preps' instead of classes 'of or relating to education and scholarship' we will not have a world class school system no matter how long the day is. The programs offered in the Evanston schools sound wonderful. Who wouldn't want their children to have the opportunities to get art, drama, music, and other enrichment classes during the school day? CPS is not offering this. Some schools are able to offer these programs during after school programs (at a cost to parents), but there is little likelihood these programs would continue with an extended school day. Even if they were offered, how many parents are going to have their children remain at schools additional time after already spending nearly 8 hours at school? There are many many schools across the city that need additional support in helping children meet basic standards in reading, math, science, and social studies, and adding additional time at some of those schools may be appropriate. However, there are also many many schools where students are consistently exceeding standards. These students will lose access to enrichment (which is crucial in becoming a well rounded, fully educated person), whether it be loss of enrichment programs within the school, or loss of time to participate in programs outside of school.